I haven't mentioned that I am taking part in this year's Blog Hub Swap. I love the The Blog Hub. It's a group on Ravelry and I have met some great bloggers through it. Last year I took part in the Knitting Crochet and Blog Week which was through the same group, but I missed out on joining in the swap because I found the group too late. I wasn't going to miss out on joining in this year! 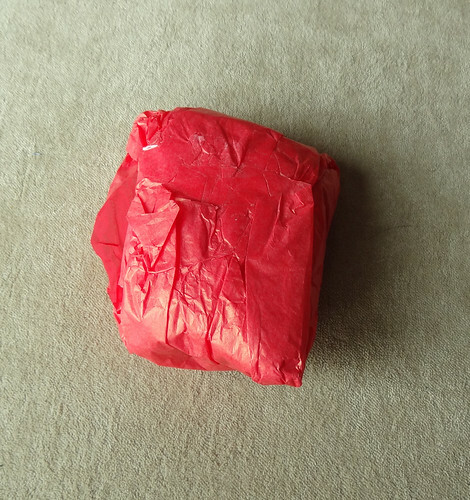 The swap is a circular swap, so we don't get a parcel from the person we send to. It's an interesting way of organising the swap, as it means you get to know two bloggers much better. You get to know the person you are making a parcel for as you have to "stalk" them and get to know their likes and dislikes, and you get to know the person who sends a parcel to you, as you get their little notes and see their choices. I'm nearly finished with wrapping up my parcel and hope to get it sent off in the next few days. I was so absorbed with putting my parcel together, I forgot I would be receiving one in turn! 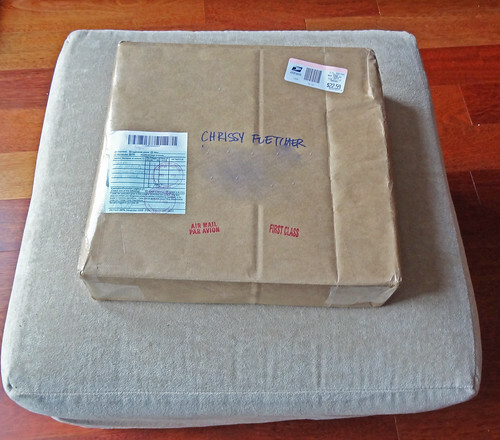 Then the doorbell rang this morning and reminded me when a parcel from New York was deposited in my hands. I could barely wait to get it open. 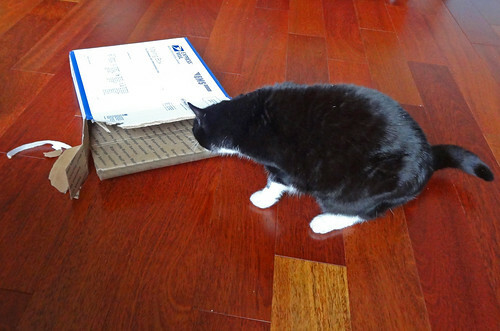 When I finally broke into the packaging, my cat decided that the contents of the box must be for her. She actually tried to get her head into the box and chased it round the room. But unless my parcel contains catnip, I'm keeping it all! When I emptied my box and had a look at the contents I was fascinated. Doesn't it look wonderful? My swap parcel was from MarieInNY otherwise known as The Underground Crafter. 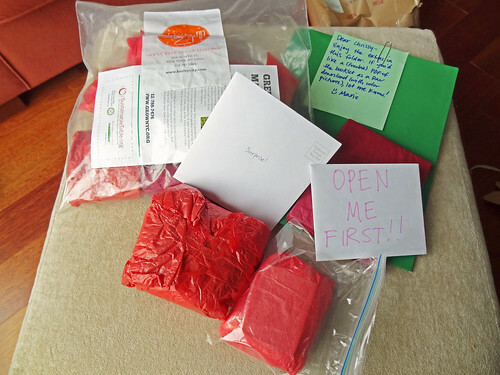 The idea of the swap is to send 7 gifts to your recipient so they can open one each day and have something to blog about. I can tell you that it was very difficult to restrain myself to only opening one! Marie enclosed a card which had "Open Me First" written on the front. So I did. My sender wanted to give me a tour around her native city of New York in my gifts. I am so excited about this, as I have always wanted to visit. It is unlikely that I will ever physically travel to New York as the flight would be too much for me and I don't know how wheelchair friendly the city is either! This will be my way of getting around somewhere that looks so exciting, but is probably well out of my reach. After looking at my pile of goodies, it appears that in addition to my wrapped gifts, I had a file of "extras" from Marie. Inside this green folder was a huge print out of quilting patterns and techniques. Marie said that she had lost her quilting mojo and hoped I could use the patterns she had included. There are so many print outs that I can't begin to look at them all, but I plan to work my way through them and have a proper look soon. 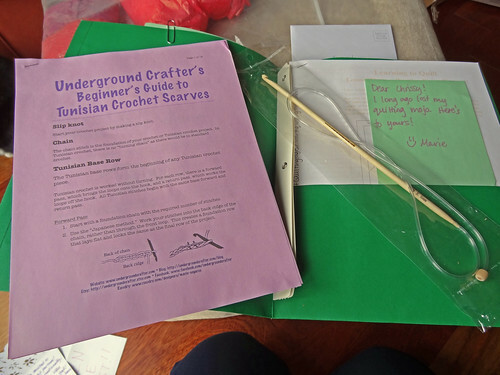 As well as the quilting print out is a Beginner's Guide to Tunisian Crochet Scarves by The Underground Crafter herself! As well as the guide, Marie included a Tunisian Crochet Hook for me to have a go at this new craft. I've wanted to try Tunisian Crochet for ages, I even bought a single Tunisian Crochet Hook at Ravelry Day in 2009. I still haven't used it! This guide looks well illustrated and just from a quick skim I can tell I will easily follow the clear instructions. In fact I am really tempted to pull out a skein of yarn and give it a go straight away! So after looking at my incredibly generous "extras" I opened the parcel that confused me the most. I had no hint as to what could be contained inside. Then I opened it up and was so happy. One of my favourite treats to myself had come all the way from New York. Proper New York nail varnish! Woohoo, how glamorous! Marie wanted to find colours with names from New York areas, and the purple one is called "Battery Park", but she couldn't track down her favourite areas, so she simply bought the colours she could see most of in my yarn stash. What a clever lady! Green and purple, my favourite colours for nail varnish. I can't wait to get one of them on my nails. Now I have to decide which one to try first - decisions, decisions. Marie's "Open First Card" also had a challenge to me inside. I intend to take up that challenge, but I will do it after my 7 packages are open. Until then, her challenge will remain a secret between her and me. Oh, what fun this week is going to be!